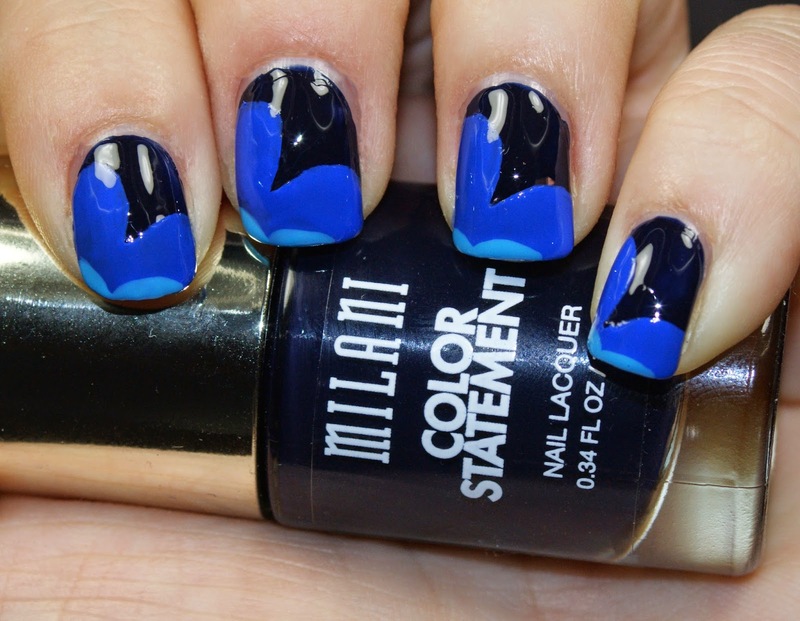 Today, I'm bringing you some nail art featuring three of the brand new blue shades from the Milani Color Statement Collection. To achieve this look, I used a base of Ink Spot, which is an almost-black shade of navy. Then I used Blue Print, a cornflower blue, to make a half-heart like shape. The last shade on the very tip of the nail is Water Front, a bright sky blue. This is a very different look from anything I've ever tried. It reminds me a little of hearts, a little of clouds, a little bit of waves. But I love how these colors contrasted against each other! Ink Spot was opaque with one coat, while Blue Print and Water Front each needed two. The formulas on these were really easy to work with and quite lovely! The new Milani Color Statement line is now available at CVS stores for just $3.99 or from Milani’s website HERE. I honestly think these are a great value at just $3.99. My CVS had them starting this summer! This is so cool! Simple, yet striking!! I love the blues in this collection! This is a fun way to wear them together.